Is there anymore of a confusion set of films than those titled Zombie? I’m gonna try and keep it as simple as possible without confusing anybody. But most people don’t realize most of the so called sequels aren’t sequels at all, but were marketed as sequels in certain places. 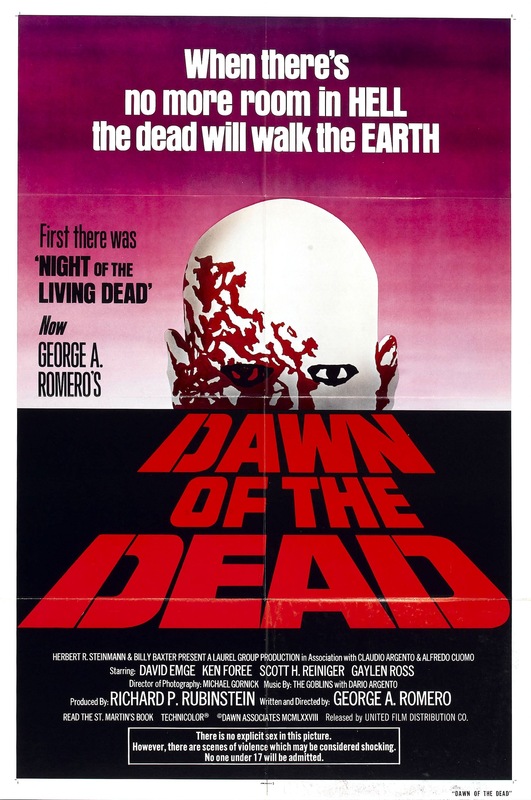 It all started in 1978 with the release of Dawn of the Dead; when released in Italy Dawn of the Dead was called Zombi. 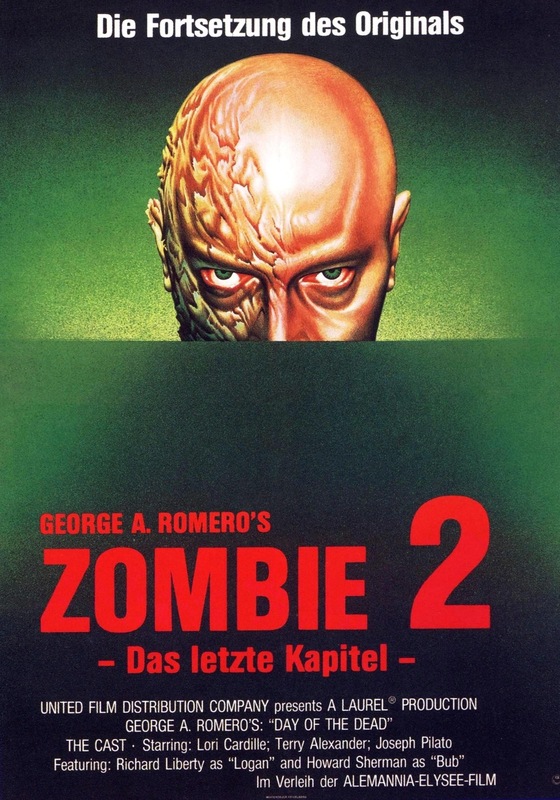 There are movies that actually predate Romero’s Dawn of the Dead AKA Zombi that are billed as a sequel, but those movies used the Zombi title during a re-release, but it still creates a confusing mess for most people. 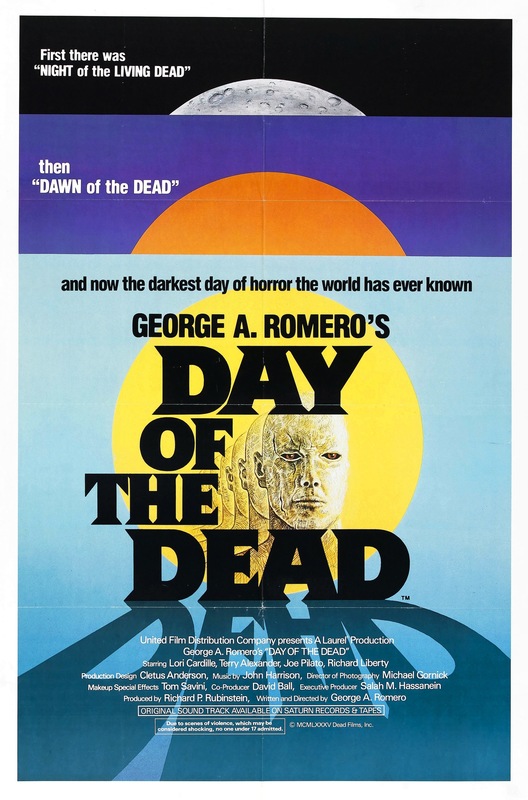 So we set up Romero’s Dawn of the Dead going under the title Zombi in Italy and the movie was a big success and Lucio Fulci’s Zombie Flesh Eaters was already shot and the producers changed the title to Zombi 2 and was released in 1979 so now people thought it was a sequel. The sad part is due to the Zombi 2 title, Fulci’s film is called a ripoff, which does make me laugh since if you’ve seen both movies they couldn’t be anymore different besides having Zombies. And again Fulci’s film was already shot. 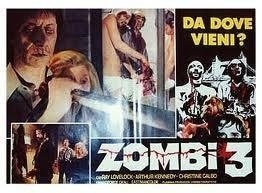 In 1988 Lucio Fulci would release Zombie Flesh Eaters 2 and in Italy it would go under the title Zombi 3. By right Zombi 3 is actually the 2nd part since Zombi 2 isn’t really a sequel to Romero’s film. I might have missed a few movies, but its not easy to find every movie under the title Zombi also I have no idea when any of these movies used the alternate title Zombi. In most cases the distributors changed the title for theatrical or video releases and most likely re-releases. So in Italy the series would go like this. In the UK the series is slightly different and different titles well sort of. Zombi 2 is called Zombie Flesh Eaters, which of course is the original title. Zombi 3 would be called Zombie Flesh Eaters 2 so thus far the UK releases are the correct ones until we get to Zombie Flesh Eaters 3. The 3rd part is called After Death, but in the UK it carries the Zombie Flesh Eaters name even if it isn’t part of the series. So the UK series goes like this. Upon their release in Germany they would be slightly different. 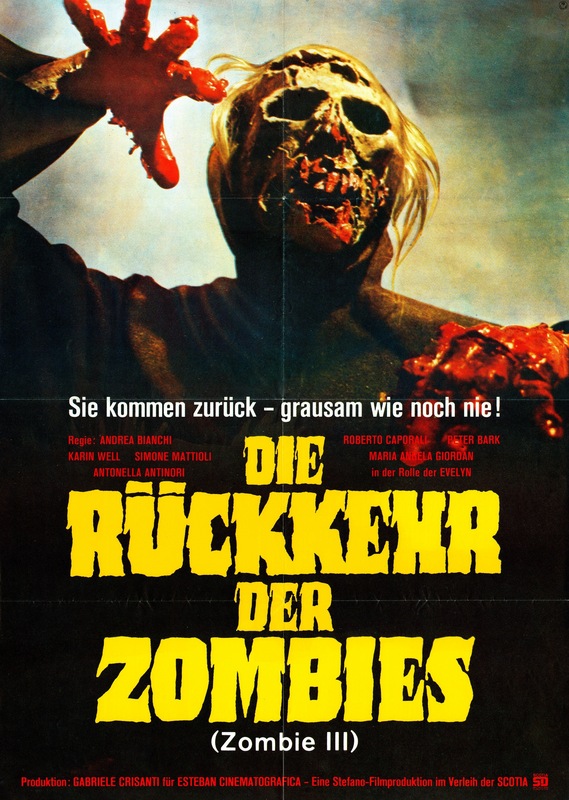 Once again Romero’s Dawn of the Dead would be called Zombi, but in Germany, Fulci’s Zombi 2 isn’t considered part of the series. 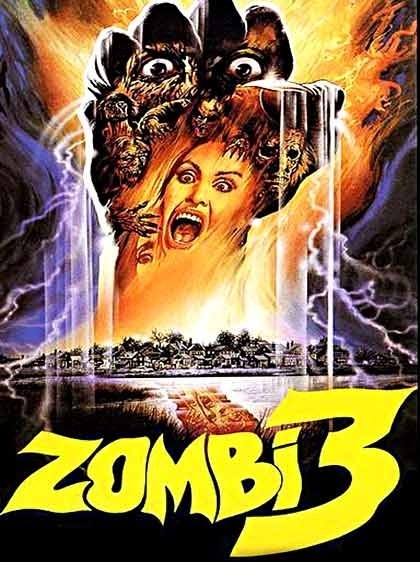 Instead Zombi 2 is actually Day of the Dead, which is the actual follow up to Dawn of the Dead and Zombi 3 would be well the 1988 film by Fulci Zombi 3, which is Zombie Flesh Eaters 2 since once again Fulci’s Zombi 2 (Zombie Flesh Eaters) and Zombi 3 (Zombie Flesh Eaters 2) are the only official parts. Are we confused yet? Kind of odd how Fulci’s Zombi 2 isn’t seen as part of the series. So in Germany the series goes like this. I find the Germam series the most interesting since its correct on the first 2 movies, but weird how they would include Fulci’s Zombi 3 rather than Fulci’s Zombi 2. Over in Thailand like the UK they are almost correct. The first film is Zombie Flesh Eaters (Zombi 2) then comes Zombie Flesh Eaters 2 (Zombi 3), but than they have 2 more films. Zombie Flesh Eaters 3 (After Death) and Zombie Flesh Eaters 4 (Killing Birds). The interesting thing here is After Death was released in 1990 and Killing Birds in 1988 yet in Thailand After Death is part 4 of the Zombie Flesh Eaters series. But different parts of the world gets these films at different times so I guess they got After Death before Killing Birds or the distributors for whatever reason could have just changed up the order. So in Thailand the series goes like this. Over here in the US the series is the same as it is in Thailand only with different titles and perhaps more confusing. So we’ve already established this all started with Romero’s Dawn of the Dead, which in some places is called Zombi. But here in the US it only goes under Dawn of the Dead. 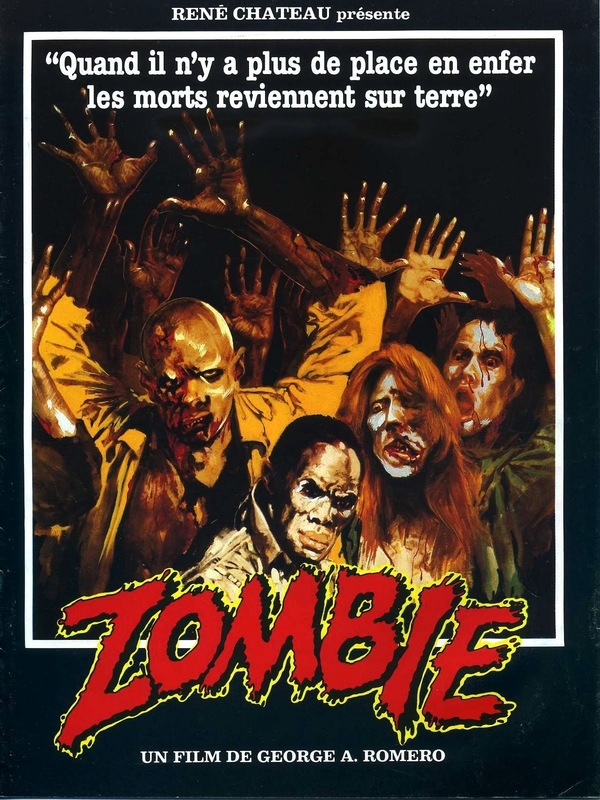 Some releases of Lucio Fulci’s film goes under Zombi 2 and other releases Zombie. 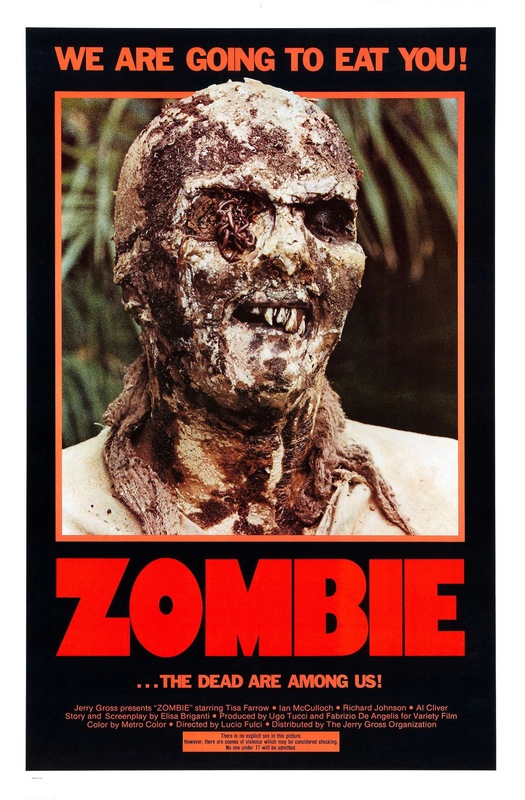 I can’t tell you how many times I have read people buying Zombi 2 then seeing Zombie unaware they are the same film under a slightly different title. Or how many people have asked I have Zombi 2 is Zombi 1 out? So the series in the US is Zombie with some releases as Zombi 2. 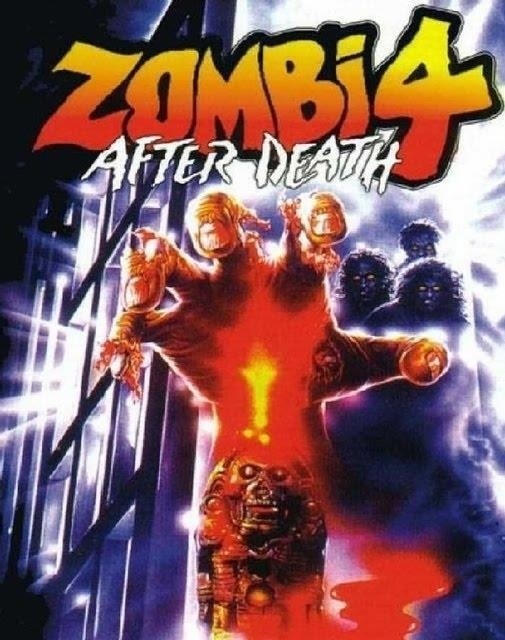 Then comes Zombi 3, which like Thailand is correct until we get to parts 3 and 4. Like Thailand the series goes in the same order with different titles. 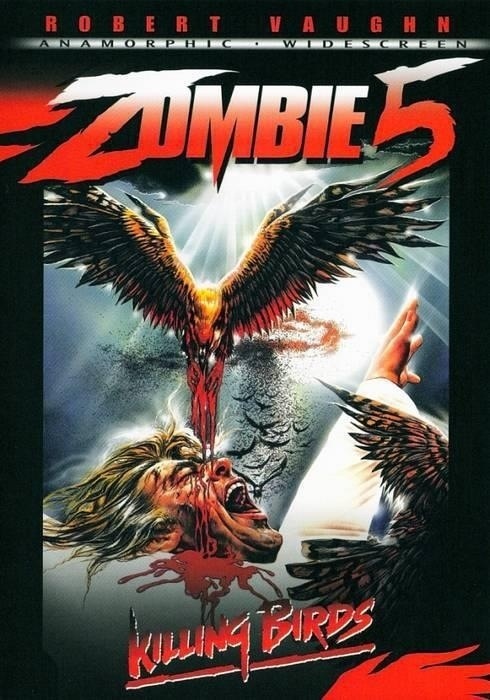 After Death is now called Zombie 4: After Death and Killing Birds is now Zombie 5: Killing Birds and remember Killing Birds came before After Death, but like Thailand After Death gets the 4 and Killing Birds 5. So the US series is the same as Thai only different titles. Are we confused now? Well I’m not done yet. By the end of this you’re head will probably be spinning much like mine was trying to write this. The film by Joe D’Amato called Antropophagus sometimes goes under the title the Grim Reaper or Antropophagus: The Grim Reaper. There was also a sequel of sorts released, which is called Absurd. Yet some video releases link these movies in with the Zombie series and screw up the order. Now remember folks, Antropophagus comes first than Absurd yet some release Absurd is billed as Zombie 6: Monster Hunter and Antropophagus is called Zombie 7: The Grim Reaper. None of these films are even zombie movies they are slasher flicks. Also despite the order being wrong when called Zombie it doesn’t matter since there is no connection between the 2 films. If anything look at them as their own movies and not sequels, but they follow a similar plot and that’s why Absurd is called a sequel even if it has no real connection. You didn’t think I was done yet right? Well in 1974 Let Sleeping Corpses Lie was released, which also goes under the title Living Dead at Manchester Morgue and for some reason Don’t Open the Window and the poster and trailer make it look like a slasher flick, but its a zombie movie. Here in the US it went under all 3 of those titles. 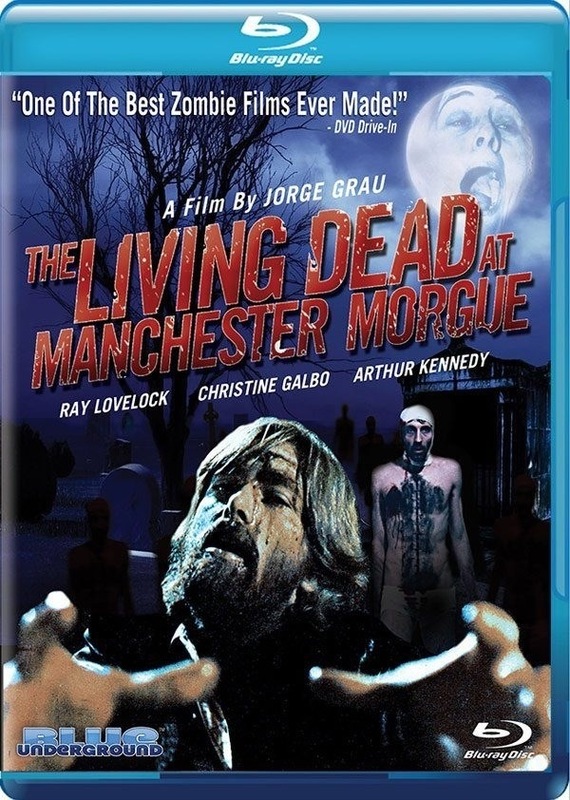 I believe the theatrical release was Don’t Open the Window and Anchor Bay released it in DVD as Let Sleeping Corpses Lie and when Blu-Underground released it they also released it under Let Sleeping Corpses Lie, but then re-released it on DVD and blu-ray as Living Dead at Manchester Morgue. Why am I bringing this up you ask? Well it has also gone under the title Zombi 3. 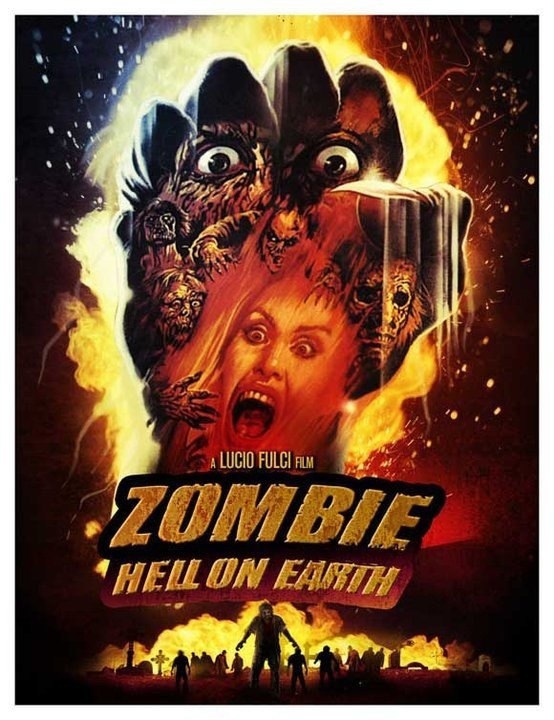 It actually predates both Dawn of the Dead (Zombi) and Fulci’s Zombie Flesh Eaters (Zombi 2). Burial Ground has also been called Zombi 3. Wow so many movies called Zombi 3 lol. There are posters for Let Sleeping Corpses Lie as Zombi 3 as well as obviously Fulci’s Zombi 3 and Burial Ground. I will include those posters at the end of the post. As for the others I assume there are posters somewhere. But can’t find them. Odds are the other movies called Zombi 3, were called that during video releases or re-titled for a theatrical release as I stated earlier. 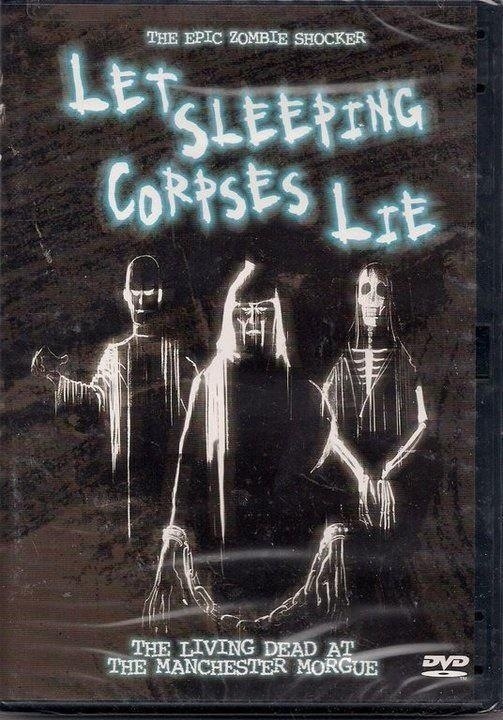 It’s very common for Italian horror movies to go under a number of different titles, Let Sleeping Corpses Lie I believe was from a production company in Spain, but had a few Italian crew members same for City of the Walking Dead, but while a Spain production was directed by Italian filmmaker Umberto Lenzi.